Idyllic panoramas of Western Canada commingled with gorgeous British Columbia summer weather and congenial countrymen helping impassion your travel experience exemplifies the lifestyle conducive to luxury brands aimed at pleasing their most passionate patrons. 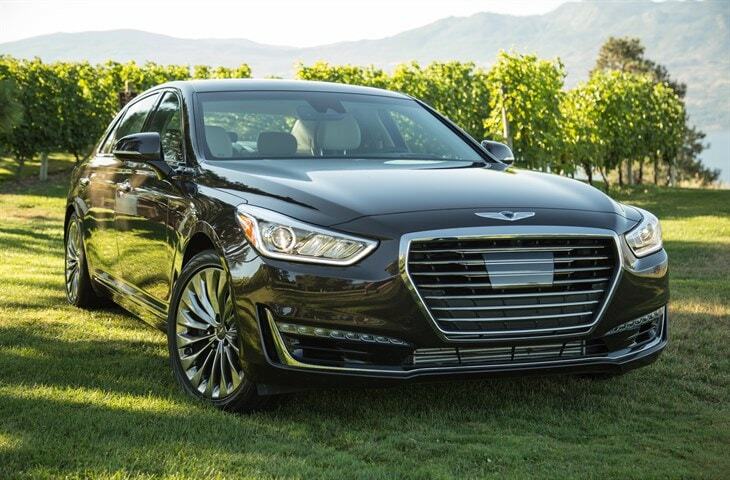 Poignantly, I was immersed for a concise period of time into a new culture from a newfangled luxury automaker to relish the emotions, the excitement, the technology and the inspiration emanating from the fresh and innovative 2017 Genesis G90 touring sedan. Would this hallmark from Korea inspire? Did it embolden me to rethink? Had it changed my perceptions? Absolutely! Canada is beautiful all year round. Think about the stimulating, chill winds of fall and onward to cold weather sporting during the majestic winters. The people are so active and alive, I was incited with a bit of momentary jealousy. Yes, I could certainly see our family being welcomed as new residents. 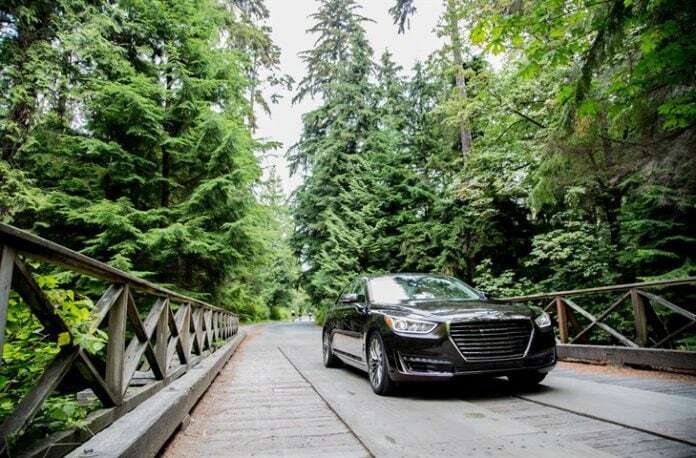 Suffice it to say, both Vancouver and Okanagan Valley were perfect suitors to launch the Genesis brand, which currently consists of the G90 full-size sedan and the mid-luxury G80. By 2021 Genesis aims to expand the lineup to six vehicles including utilities and sports coupes. The idea to separate the parent company, Hyundai, from the automotive outlier Genesis was brilliant. When the Equus arrived a few years ago it presented an alternative option for consumers looking for total opulence without spending Mercedes-Benz S-Class, BMW 7 Series or Audi A8 money. Throughout our four-month loan of the Equus in 2014, many were flabbergasted that our ride was in fact a Hyundai. Switch scenes to the formidable Hyundai Genesis sports sedan, which struck the consumer market like lighting (won the 2009 North American Car of the Year), and now you begin to see how the vision was prophesied by company officials. They believed the time had come to launch Genesis and didn’t hesitate since the resources were in place. From dedicated platforms and powertrains, to documented owner experiences and expectations, executives were all too confident and ready for potential sales success. Genesis is only the second luxury brand to launch in the 21st century. According to Raphael, luxury continues to evolve and change, but the substance has to be there. Customers at this level aspire to be a part of an entity and feel respected from the brands they settle with. They also need to know their time is being spent well. For example, if you pay $80,000 to $100,000 for a vehicle then you certainly do not wish to devote unnecessary time in your dealership like Range Rover owners. In fact, my wife has owned an Audi Q7 TDI four years. She is tired of running back and forth to the service counter for mind-boggling quality failures. Raphael goes on to add that time is a precious, nonrenewable resource, and he is absolutely correct. Luxury is a balance between product and experience, it’s life enriching and curated. No, Genesis will not take away mass volume from S-Class aficionados, but they will grasp the attention of those looking for more for exponentially less. Genesis recruited executives from Bentley, Lamborghini and Lexus. From design and performance to marketing and branding, the success formula had to be perfect. Aesthetically, the vision saw the removal of normal boundaries to expand the soul of the G90. While in motion, the G90 does look, drive and feel like an executive sedan. But it also lacks some of the emotion you get from a competing German sedan. Even with the massive signature grille, LED accents on the headlamps and LED daytime running lights, elongated hood, 19” chrome alloy wheels, chrome trimmings, vertical LED taillights and large, flushed asymmetrical exhaust tips, the G90 is still missing a few emotional cues. The wheels, for example, are classy but devoid of sporty traits. The sunroof is too small. A sports package needs to be a future option similar to the S-line, M Sport or AMG packages in competitive models. I believe Genesis will continue to improve upon the imagery, but for now, it’s an impressive start to something fresh. Open the soft-touch power doors to bask in the beauty of the commodious and lavish abode and begin to enjoy your driving oasis. 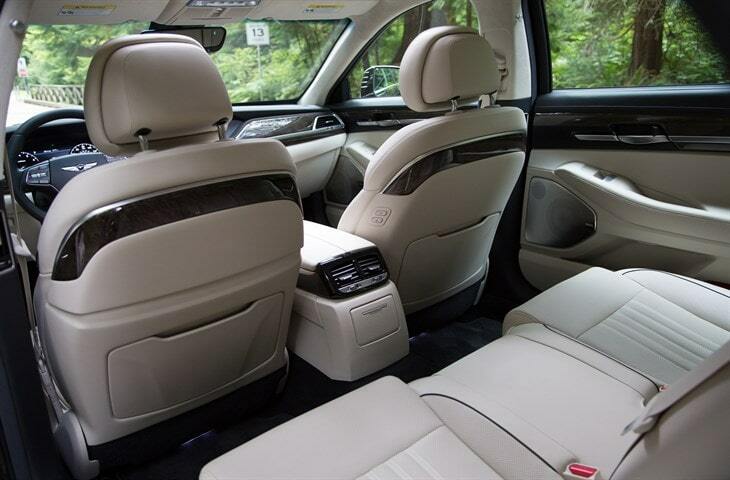 Sitting in the rear, I was in heaven while adoring the comfortable amenities of the gentle headrests, extended legroom, privacy screens on all three windows and operation of various adjustments from the center control console. 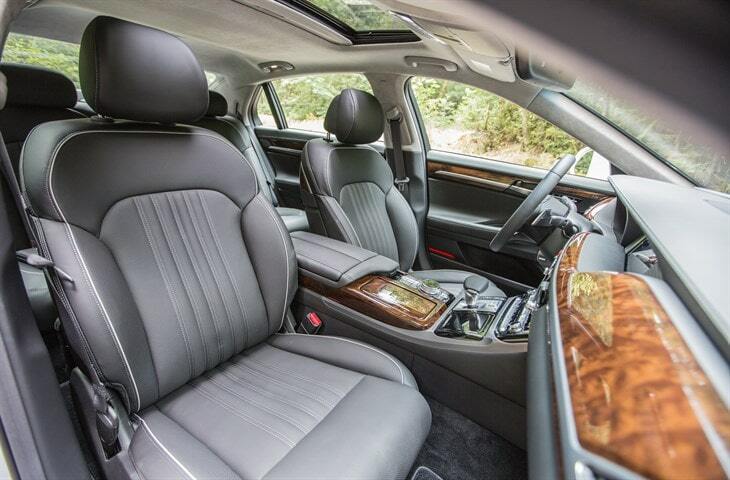 Throughout, the cabin is ripe with Nappa leather, genuine veneers, a 22-way adjustable driver seat (16-way passenger), cooled and heated seats on the V8 model, quiet and serene environment do to double-pained acoustic glass, soft-touch controls and 3-zone climate. A 17-speaker Lexicon premium audio system with Quantum Logic Surround and Clari-Fi music restoration is also at your disposal. Watching video on the 12.3” multi-media screen for example was quite the experience. The center clock and wireless device charging are nice touches and when the smart trunk senses the key from the rear it opens the lid automatically. The Genesis G90 comes in two distinct models; either the G90 5.0 Ultimate or the G90 3.3T Premium. For the 4-hour ride from Vancouver to the immaculate Sparling Hill Resort, I chose a Caspian Black 3.3T with the 3.3-liter Twin Turbo V6 engine producing 365-horsepower and 376 lb.ft. of torque starting from 1,300 rpms. The 5-liter V8 distributes 420-horsepower and 383 lb.ft. of torque. Both are paired with an 8-speed automatic transmission with SHIFTRONIC, steering wheel paddle shifters and Intelligent Drive Mode with Sport, Eco or Individual settings. Either RWD or AWD can be had with both models. The V6’s midrange power is abundant and makes you wonder if a V8 is actually needed. However, the vehicle does lack the taut driving dynamics of a 7 Series. Where most advanced safety and smart features are optional in the premium class, Genesis provides them as standard. Some include Smart Cruise Control, Heated Steering Wheel, Lane Keep Assist, Multi-view 360 degree camera, Power Reclining Rear Seats, Smart Blind Spot Detection, Heads-up Display and Automatic Emergency Braking with Pedestrian Detection. Also new to Genesis Connected Services (3 years complimentary) is Amazon Alexa skill that allows you to send remote commands from your home to your vehicle such as remote engine start or remote door lock/unlock using the Amazon Echo, Echo Dot and Amazon Tap. Your Genesis will additionally include complimentary scheduled maintenance for three years or 36,000 miles and complimentary valet. A dealer representative will come to your home to pick up your Genesis and drop off a loaner. Also complimentary for three years are Enhanced Roadside Assistance, Sirius/XM and Map Care. I’m sure you’re also aware of the 10-year/100,000 mile powertrain warranty and 5-year/60,000-mile new vehicle warranty. The G90 represents virtuous aspirations for special individuals who identify with social uniqueness. From the NFL partnership to the prestigious PGA TOUR Tournament in Los Angeles the Genesis brand will soon become omnipresent by way of the lifestyle activities you most desire. Stay tuned for pricing which has not yet been released.